A guide to make the Ascended Shadow of Grenth and Light of Dwayna backpieces released with Wintersday 2013. You can purchase the recipe on the Trading Post or acquire it as a rare drop from the Wintersday gifts. The recipe requires Leatherwork, Armorsmith or Tailor 500 and you cannot craft it without the recipe. The backpiece doesn’t come with stats by default but you can click to select one. This is a one time selection only and you cannot change the stats ever again. Crafted by Artificer/Huntsman/Weaponsmith/Leatherwork/Armorsmith/Tailor at 500. 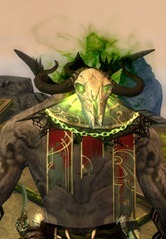 Angur’s Stone is purchased for 20 skill points from Miyani near Lion’s Arch Mystic Forge. These are purchased from Rojan the Penitent in Frostgorge Sound (around Earthshaker Basion) after Claw of Jormag is defeated. They cost 1 gold each, totaling 50 gold. Bolt of Wool, Cotton, Linen are all refined from their individual scraps but Spool of Silk Weaving Thread is made from the following recipe (Tailor/Armorsmith/Leatherwork 450). This product is time gated (can only one once per day) which makes production of Bolts of Damask is also time gated (but you can purchase it on the trading post). Are the back pieces free from light/med/heavy designations? If I have a 500 leather worker can I craft it for my Mesmer? Yes I believe so. None of the backpieces are class restricted so I don’t see why they would start now. will the crafting of this backpieces be available also after winter’s event? Did these backpieces have any stat? Yes you can select a stat when you finish crafting it. You are lucky. I opened several hundred, not seen a recipe yet. But if i apply a skin on 1 of these backspacks.. what happen? i could continue change the stats? The stats is one time selection only. Once you select the stats, it cannot change stats again. Can i see the stats anywhere or no pics of them yet or any info :P?? at work so cant go in game. I’m interested of how much stats they give. Are you a wizard ???. Thank you. That’s the set i’m using. Kind of related question. 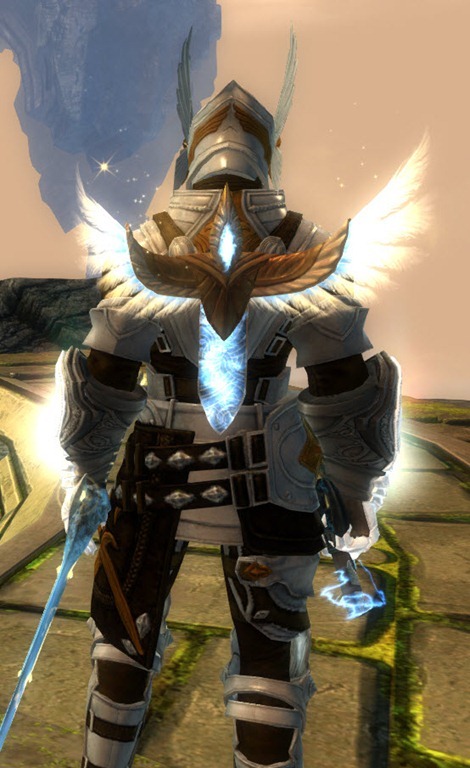 If I already had an Ascended backpiece, created this one, and then transmuted them together, do you get to transfer the infusion on the first backpiece if it already had one? Or is it lost in the transmutation? The recipe for Light of Dwayna is account bound anc can’t be sold at tp. Is this a bug? Think the bug is with the Grenth stuff, there’s a spot on the TP for the actual Grenth back too. Pretty sure the Dwayna stuff is behaving as it’s supposed to (at least with regards to all the other Ascended stuff). 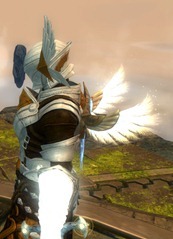 the wings of dwayna fits an guardian rather nice i wil want to get thoese i hope i can get them =) wel how much do the recipes kost acctuly today ? Or just gold.. You can buy Bolt of Damansk from the tp but overpriced atm. All paths or at least 2 of each, add in Fractals and Arah too if you can and you’ve got 50 Gold in no time. Even minimum i wouldn’t have said 15 days, 7 maybe. It’s all dependent on how much free time you have, and how good the dungeon team is. I run those dungeons in the space of about 3 hours a night after work. What would be the estimated total cost if you buy all the stuff(at current TP prices or NPC prices)? And what other ways are there if you only look for stats(I heard fractals – how much does it take fo farm there in time estimated? I usuall don’t to fractals and don’t know). About 3750 gems at current exchange rates (200 gold) or around $45. is it infused?i mean does it have 2 slots for ar? Although they have great stats and look great, they will be like Fractal weapons. You can get them if you want but you won’t see that much because of the cost and time. What do you think guys. Well you have a point because maybe the overall price might be about 70-80 gold, but the main thing is the Dragonite Ore. Not many people do WvW or camp for bosses. dragonite ores arent that much of a problem just do guild missions and world events I rarely camp for them. Is the stat selection limited to the ones already existing for the other ascended backpieces? This was a good chance to allow Jewelcrafting 500, instead of giving these to the armor crafetrs, but whatever. I wonder whether they can be infused. Are all the stat combo’s there? Like for example carrion or valk, can we finally get one of those stat combo’s through these 2 backpieces? This is off topic but what armor is your character wearing in those pics of the dwayna back piece? I can t find it! Hello Dulfy, please can you tell us what stat combos we can choose from new backs. Can i get for instance celestial stats? Yes all the stats are available I think. Celestial, Soldier, Carrion etc are definitely there. Not too sure about Sentinel. The list of stat options. Great guide! However, after looking at it closer the reciepe should be 1500 Silk Scraps not 4500 Silk Scraps for the Raw materials listed in the Damask part. Oops my bad. I thought it was Bolts of Silk listed. 1500 Bolts = 4500 scraps. So it is correct. Crafted the Light of Dwayna but can’t upgrade it to an infused version. 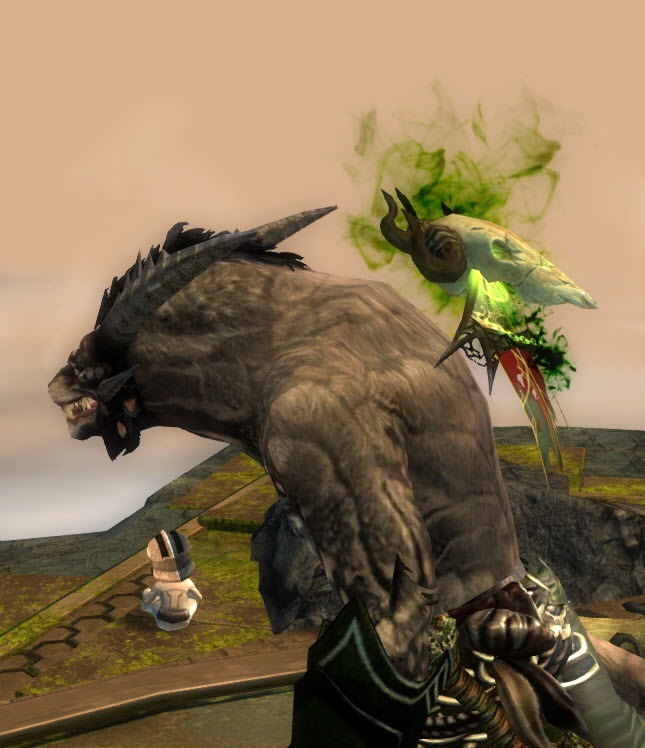 GG Anet.